The safety of your street rod is of vital importance. If the street rod does not meet a certain set of guidelines, an accident can cause more than just replacing the parts. The NSRA or National Street Rod Association is the organization doing the safety inspections. Keep in mind that these safety inspections are completely voluntary. In most cases, safety inspections can be done at many of the street rod shows around the country. Generally, when a safety inspection is done, it is good for one year. The following is a list of safety inspection guidelines that need to be considered as a street rod enthusiast builds the street rod. or a calibrated tachometer set at 65 miles per hour. driver’s side of the vehicle. 4. Glass…………………....Glass must be a safety plate, lexon, or tempered glass. a brake light, and a license plate light. must meet D. O. T. specifications. steering system and the components must be safely mounted. 11. Fuel System………….…Must have a vent on trunk and interior mounted tanks. Also, no clear, plastic lines allowed and no leaks. edge of front door and exit exhaust away from vehicle. 13. Self-Aligning Rod End Bearings……….No fractures, insert sloppiness or binding. travel (2 inches) in each direction. suspension movement and turning. See arrow on photo below. components below the scrub line. Recommended Equipment (Without this equipment it may be reason for failure). 17. Windshield……….….…..Should be AS-1 rating. 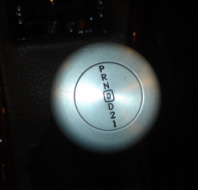 3 speed standard shift transmission. See photo below. Shift pattern should be visible. 19. Fuel Lines:……………....All fuel lines should be safely mounted and routed. the same outside diameter as the housing or larger. 22. Brake Lines…………...…All brake lines should be safely mounted and routed. 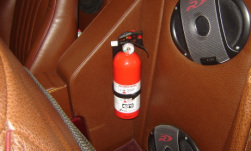 Fire extinguisher in driver/passenger compartment. Note: Completion of the NSRA vehicle inspection warrants only that the vehicle complies with equipment requirements recommended by the National Street Rod Association. The National Street Rod Association vehicle safety inspection is only advisory and is not to be construed as an official legal clearance, and the National Street Rod Association, its employees, officers, delegates, agents, or anyone assisting the Association assumes no responsibility for the advisory clearance.